Sumo is Japan's national sport, an explosive style of wrestling that can be from a few seconds to in exceptional cases minutes. Sumo has its roots in ancient times and was a performance to entertain the Shinto gods. . The rules are very simple: When you are fighting in the circular ring no other part of the body other than the soles can touch the floor. Also the first who comes outside the ring with any part of the body has lost. The ring is elevated and called a "dohyo", measuring 4, 55 meters (14,9 feet), and is made of clay and covered in a layer of sand. One should not be fooled by a sumo wrestler (osumo san) look overweight. All participants in the grand tournaments are well-trained athletes with speed, balance, strength and explosiveness surprises. Top ranked in sumo is the Grand Champion (Y) okozuna). This title will receive the wrestler who wins a total of six major tournaments which annual is arranged from January to November. Three of the six Grand Sumo Tournaments are in the Sumo Stadium Ryogoku Kokugikan in Tokyo (January, May, September), and one each in Kokugikan, Osaka (March), Kokugikan Nagoya (July) and Kokugikan Fukuoka (November). Plan your next trip to Japan so you also can watch a Grand Sumo Tournament. 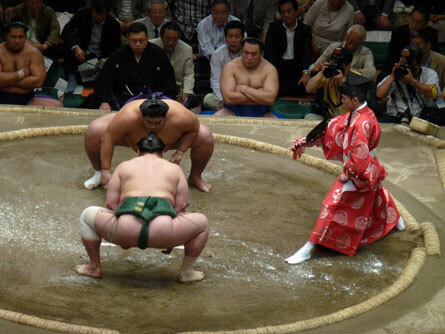 Since there are no weight classes in sumo, the weight difference in a match can be extreme. Therefore strive most of the wrestlers to achieve a maximum weight without affecting speed and mobility. As the training is hard, it is important to always ensure that you do not lose weight. Therefore sumo wrestlers eat its own special type of food called Chanko-nabe (A stew with noodles, vegetables, meat, fish are added to a thick broth) which is served in a pot (nabe). This is the staple food for all sumo wrestlers. Sumo wrestlers typically live together in houses and training complexes called "stables" (heya). Everything is exceptionally disciplined in all aspects of their life, from training, eating to sleeping. Even free time, is strictly regimented by the "stable master" (oyakata). There is always discussions about who is the greatest sumo wrestler of all time. Many vote for Taiho (Koki Naya) as he was the youngest ever yokozuna. Taiho made his debut in the mid-1950´s and in 1960 he won his first Emperor’s Cup at 20. This made him the youngest champion in sumo’s 2,000-year history. He won the Emperor’s Cup a record 32 times and six consecutive tournaments. Taiho retired in 1971. His height and weight; 187 cm and 124 kg. Taiho was born May 29, 1940 and died January 19, 2013.